Miniaturized laboratory-on-chip systems promise rapid, sensitive, and multiplexed detection of biological samples for medical diagnostics, drug discovery, and high-throughput screening. Using micro-fabrication techniques and incorporating a unique design of transistor-based heating, researchers at the University of Illinois at Urbana-Champaign are further advancing the use of silicon transistor and electronics into chemistry and biology for point-of-care diagnostics. Cross-section of device with a droplet. The left side shows an unheated droplet with the DNA FRET construct in the double-stranded form. 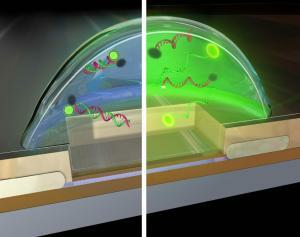 The right side shows a heated droplet where the FRET construct has denatured, resulting in an increase in fluorescence. Lab-on-a-chip technologies are attractive as they require fewer reagents, have lower detection limits, allow for parallel analyses, and can have a smaller footprint. “Integration of various laboratory functions onto microchips has been intensely studied for many years,” explained Rashid Bashir, an Abel Bliss Professor of electrical and computer engineering and of bioengineering at Illinois. “Further advances of these technologies require the ability to integrate additional elements, such as the miniaturized heating element, and the ability to integrate heating elements in a massively parallel format compatible with silicon technology. “Our method positions droplets on an array of individual silicon microwave heaters on chip to precisely control the temperature of droplets-in-air, allowing us to perform biochemical reactions, including DNA melting and detection of single base mismatches,” said Eric Salm, first author of the paper, “Ultralocalized thermal reactions in subnanoliter droplets-in-air,” published in the Proceedings of the National Academy of Science (PNAS) on February 12. 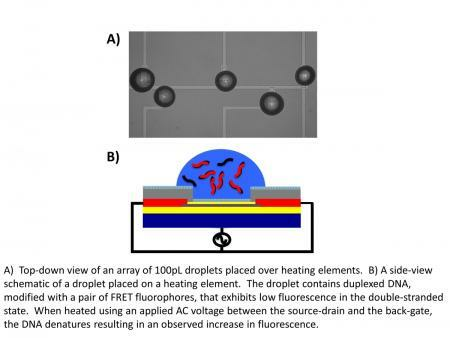 According to Salm, approaches to perform localized heating of these individual subnanoliter droplets can allow for new applications that require parallel, time-, and space multiplex reactions on a single integrated circuit. Within miniaturized laboratory-on-chips, static and dynamic droplets of fluids in different immiscible media have been used as individual vessels to perform biochemical reactions and confine the products. “This technology makes it possible to do cell lysing and nucleic acid amplification reactions within these individual droplets – the droplets are the reaction vessels or cuvettes that can be individually heated,” Salm added. “We also demonstrate that ssDNA probe molecules can be placed on heaters in solution, dried, and then rehydrated by ssDNA target molecules in droplets for hybridization and detection,” said Bashir, who is director of the Micro and Nanotechnology Laboratory at Illinois. “This platform enables many applications in droplets including hybridization of low copy number DNA molecules, lysing of single cells, interrogation of ligand–receptor interactions, and rapid temperature cycling for amplification of DNA molecules. “Notably,” Bashir added, “our miniaturized heater could also function as dual heater/sensor elements, as these silicon-on-insulator nanowire or nanoribbon structures have been used to detect DNA, proteins, pH, and pyrophosphates. "This is a very exciting technology development," Bashir said. "Equally important, it offers us a versatile platform to explore (in a massively parallel configuration) the physics and statistics of DNA hybrization in extremely small confined volume. In a way this is biomimetic, after all this is exactly how DNA within a cell can follow its own dynamics, unperturbed/independent of DNA dynamics of the cells nearby." In addition to Salm and Bashir, co-authors of the study included Carlos Duarte Guevara, Piyush Dak, Brian Ross Dorvel, and Bobby Reddy, Jr. at the University of Illinois; and Muhammad Ashraf Alam, Birck Nanotechnology Center and the School of Electrical and Computer Engineering at Purdue University. Contact: Rashid Bashir, Micro and Nanotechnology Laboratory, 217/333-3097. Writer: Rick Kubetz, Engineering Communications Office, University of Illinois at Urbana-Champaign, 217/244-7716.